Peak Energy: Is 3D printing an environmental win ? Is 3D printing an environmental win ? 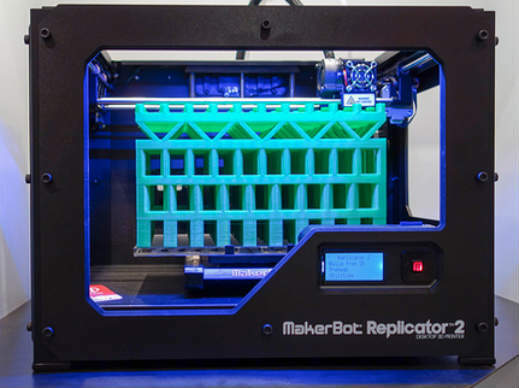 Jeremy Faludi at GreenBiz.com has a look at the environmental impact of 3d printing - Is 3D printing an environmental win ?. Technophilic environmentalists, including myself, tout the 3D printing revolution as a boon that could eliminate waste in manufacturing. But is that really true? Even if it is true, does it matter compared to the extra energy used? And what about toxins — does it release more, or less? No one has done this comparison before in a comprehensive, quantitative way, so some colleagues and I in the UC Berkeley mechanical engineering department set out to find the answers. The results were tricky and surprising. First, let's bust a myth: 3D printing does not mean zero waste. There are many kinds of 3D printers, making things in very different ways; we measured two kinds. An "FDM" machine (such as a RepRap or Makerbot, sort of a hot glue gun with XYZ controls), actually can have a negligible percent waste, if your model doesn't need any support material to shore it up while printing. (That's a big "if.") But we found that an inkjet 3D printer (which lays down polymeric ink and UV-cures it layer by layer) wastes 40 to 45 percent of its ink, not even counting support material, and it can't be recycled. Other researchers studying other kinds of 3D printers have found significant waste in some of them as well. To see whether 3D printing will be a sustainability win, we compared it to machining by a computer-controlled mill (starting with a block of stuff and cutting away everything you don't want). We only looked at machining things out of plastic, because that's what these FDM and inkjet 3D printers do. Let's be clear: most plastic consumer products are not machined; they're injection-molded. But 3D printing is not going to replace injection-molding for mass-manufactured products (plastic parts made in the millions). It is replacing machining for smaller runs (1 unit, 10 units, maybe 1,000 units). The 3D printers' impacts mostly came from electricity use, which is simply a function of time, so anything that reduces the time spent running also reduces eco-impacts. The mill's impacts were mostly from material use and waste, but energy use was significant too. The resources and manufacturing to make the machines themselves was a small portion of impacts when they run at high utilization, as shown above; but if you only make one part per week, those embodied impacts can be significant for the FDM and the mill. The final verdict, then, is that 3D printing can be greener, if it's the right kind (FDM); but again, the biggest environmental win comes from sharing the fewest tools so each has the most utilization. If you want to know more, the full study (with far more detail in methodology and results, including breakdowns of impacts by source for all 22 scenarios studied) has been submitted to the Journal of Rapid Prototyping. Be patient, though; peer-reviewed academic publications take a year or more to get published.